In this special Thanksgiving episode of #ThisOldMarketing, Robert and I discuss the amazing new content marketing launch for Y Combinator called “The Macro,” and explain the benefits it’s likely to provide to its innovative publisher. Next, we’re not surprised that 20 big publishers are having trouble generating revenue from Facebook Instant Articles. Our solution? Syndicate their content to Facebook. After that, we disagree with a Gerry McGovern post about quality content versus content marketing and ponder the implications of Ad Age’s data-driven content predictions. Rants and raves include a seminal book on business strategy and an article that claims to highlight examples of content marketing – only many of them aren’t. We wrap up the show with an example from U.S. Military Hospitals. Y Combinator launches The Macro (3:44): Y Combinator, a boot camp and accelerator for start-up companies, has launched The Macro, a digital magazine that contains candid advice for people planning to start a new business. It helps keep past start-up founders and mentors up to date on the program’s successes and failures, and is also a powerful recruiting tool. Robert and I think it’s a brilliant idea that should serve the organization well; he shares another powerful benefit it’s likely to provide to Y Combinator. Facebook Instant Articles (9:06): Facebook is experimenting with new advertising approaches for its Instant Articles platform because publishers encountered challenges generating ad revenue from it, reports The Wall Street Journal and Engadget. Robert and I are shocked that publishers didn’t anticipate this problem, considering Facebook’s strict ad guidelines. We explain why syndicating their content makes more sense. Less content marketing, more quality content (19:00): Unless marketers focus on quality content that is helpful, explanatory, and supportive, the practice of content marketing will descend into a morass of irrelevancy and waste, warns Gerry McGovern. In his blog post, he makes the case that content marketing is bad, but producing more quality content is good. Robert and I agree this is yet another example of categorically condemning a practice based on a handful of bad examples. B2B data-driven trends (29:17): Data-driven, programmatic technology has been transforming brand advertising over the last five years, but it’s only in the last year or so that B2B marketers have really been able to leverage it. The widening availability of quality B2B data means that business marketers now have the opportunity to target and optimize campaigns with incredible precision and efficiency, claims Ad Age. Robert and I agree these trends may be accurate – but they won’t happen in 2016. 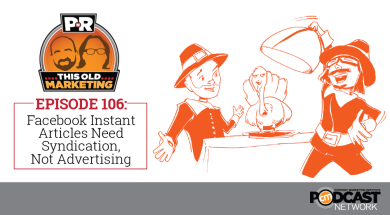 Robert shares one capability that’s available today that most brands are underutilizing. CMI University: Winter enrollment for CMI University’s online training curriculum is now open through December 31, 2015. Enrollment will be limited to the first 500 students. CMI University includes over 20 hours of specialized content marketing training, from planning to measurement. If you sign up before December 31, you will also get free Content Marketing World 2015 video on-demand access (a $595 value) and free Content Marketing Show 2015 video on-demand access (also worth $595). For all the details, visit http://cmiuniversity.com. Robert’s rave: Robert is thankful for Rita Gunther McGrath, who wrote an awesome book titled Discovery-Driven Growth. It recognizes that planning for a new venture involves envisioning the unknown, rather than simply extrapolating from the present. Discovery-driven planning acknowledges that at the start of a new venture, little is known and much is assumed. Her approach is integral to the technique of story mapping, which Robert and his co-author Carla Johnson discuss in their book, Experiences. Joe’s rant: Marketing Land recently published an article titled Content Marketing Done Right: 8 Examples You Can Learn From. Unfortunately, several of the examples it highlights are ads, not content marketing. The author even includes Share as Image, which is a product. This article is very misleading, because the author doesn’t have a clear understanding of what content marketing is. U.S. Military Hospitals: Between 1918 and 1919, at the end of World War I, dozens of U.S. military hospitals produced magazines designed to lift the morale of wounded soldiers recovering in these facilities. They served as “safety valves” to help relieve the stress experienced by frontline soldiers and their caregivers. Endorsed by the Surgeon General’s Office, these publications contained a variety of entertaining articles, jokes, poems and illustrations; most of the content was contributed by veterans. During the holidays, the content of these magazines was especially festive. 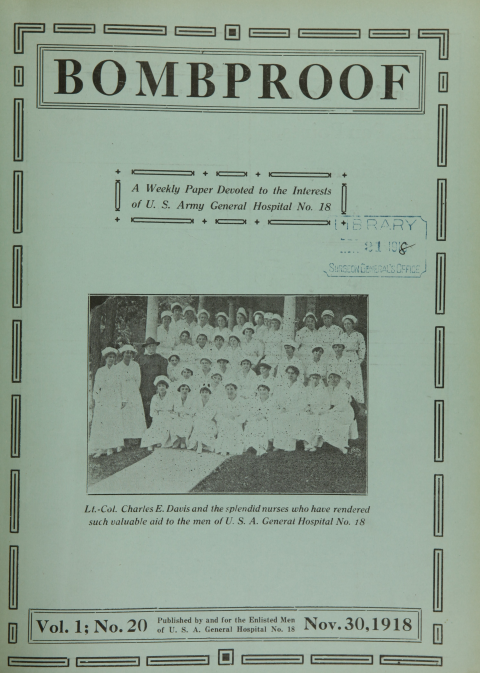 Bombproof, the magazine of U.S. Army General Hospital No. 18 in Waynesville, North Carolina, describes the festivities as wounded veterans enjoyed their first “Thanksgiving dinner deluxe” in many years. These magazines are awesome examples of #ThisOldMarketing.